Happy Wednesday! It’s been a really trying last few days for me. I got back from my killer Blissdom Conference here in Nashville. That was a whirlwind, will be sharing about that later! Pretty much immediately, Britton has come down with something. The poor baby. I really hate when my girls are sick. Took her to the doctor today and we’ve got an ear infection with a side of tonsillitis. I’m just glad to finally know what it is and that we can fix it fairly quickly. I think I’ll need some quick dinners over the next few nights. Here’s one in fact, that is healthy and quick at the same time and it is a favorite at our house. We love mexican food. I would marry it if I could. That’s how deep my love for mexican food runs. Not only is it quite tasty, but my entire family likes it which makes my life easy. When I came across this awesome Taco Salad idea at Dashing Dish, I absolutely HAD to try it. Brace yourself, it’s another duh moment. 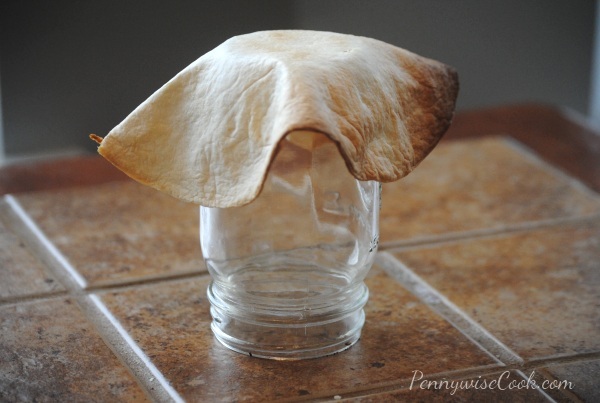 Take a flour tortilla, drape it over a jar or mug or can, bake for 8-10 minutes and voila! 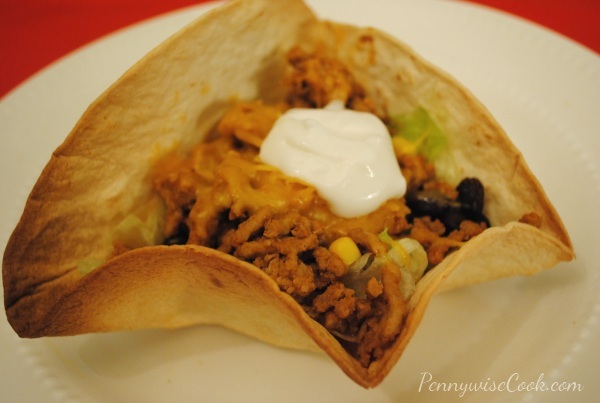 This isn’t as much a recipe as it is a brilliant idea for a healthy taco salad. Most taco salads are loaded with calories because the shells are fried. Yes, they are amazingly tasty but you pay for it. So when I saw this idea, I thought to myself my life is complete. At only around 100 calories for one tortilla , depending on your toppings you can have an entire taco salad for around 300 calories. Not to mention the fact that you can buy a package of flour tortillas for $1.00- $1.25 at most stores. I used a mason jar to drape my tortillas over. I also took the corn out of a can (to use in my taco salads) and removed the label and used it too. I made a total of 6 of these in batches. You do kinda have to finagle them to get them to stay in a pretty shape on the can or jar. Once they start to crisp in the oven, they keep their shape. This is what mine looked like when it came out of the oven. Super toasty and ready for the taco filling! Thanks to Dashing Dish for this fantastic idea! 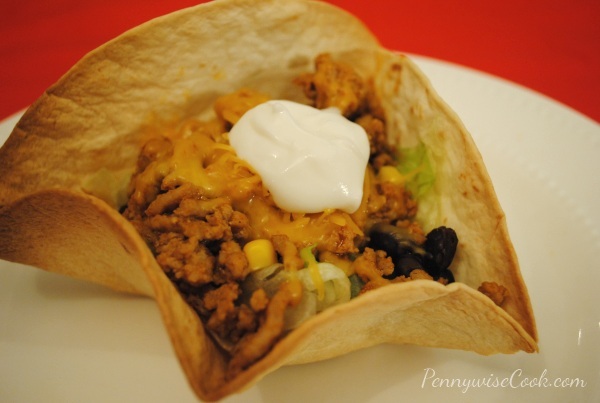 This super easy and quick option for a taco salad is also healthy and tasty at the same time! Place jar or can on baking sheeting. 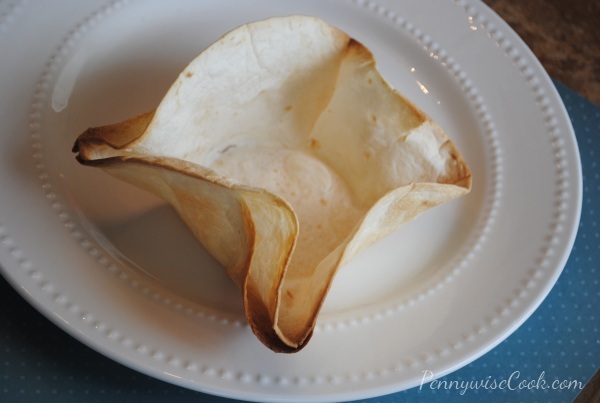 Drape tortilla over jar and cup to make desired taco salad shape. You may need to hold it there until right before you place it in the oven. Bake for 8-10 minutes or until golden brown and crispy. Place desired filling inside and you're done! 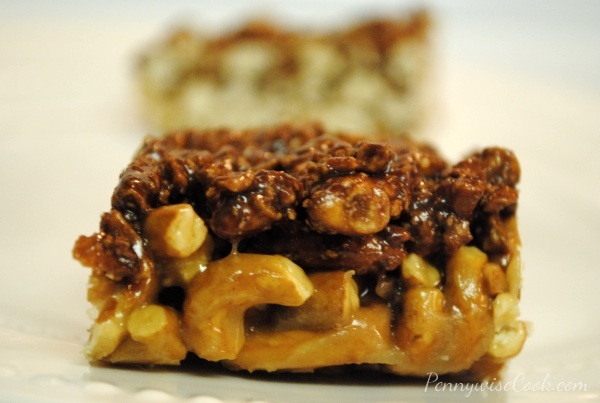 Tip- you can make these ahead of time and store in the microwave until ready to use. I make them in the morning and then fill mine for dinner later on. I’m so thankful to you who have been providing me feedback for this blog so far. I’m not yet used to being a “foodie” blog just yet, so I’m just getting my feet wet with what you guys need and what I need to do to make things easy for you. One of the things that I’ve been working on it getting the recipes printable for you! I finally have found a plugin to make it simple to click and print each recipe. And you won’t have to worry about the entire post printing too- just the recipe itself. All of the recipes are going to have a dotted-line box around them like this. You see the print button which you just click and it will give you your printer prompt to select how many copies and all that fun stuff. Next, check out the Save Recipe button. In order to use this feature, you’ll have to have an account but I think it’s totally worth it All it takes is an email and password. No big profile to fill out. Your ZipList Recipe Box can be used with any blog or website that has this option. Trust me, there are tons. You may not have noticed before, but on many websites it’s there. Once added to your Recipe Box you can come back to it anytime (by going HERE) for printing or reference and your recipes are all collected in one place. 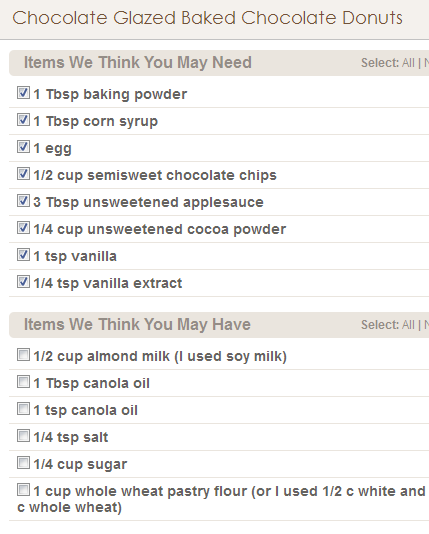 It will even give you the option to add things on the ingredients to your shopping list like so. They even predict what you might have on hand. Of course you can add them to your list if needed. How cool is all of this? I have already added this option to ALL previous recipes and posts and it will be there from here on out. Will you be using this? Let me know what you think, I really appreciate your input! Note- to print recipes, you will not need to login or create an account. 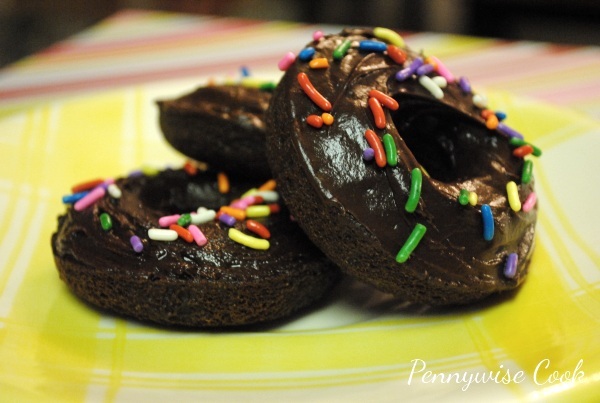 That’s why I was absolutely thrilled to come across this amazing Chocolate Glazed Chocolate Baked Donuts recipe at Prevention RD. She has got some fabulous recipes that I cannot wait to try. I really wanted to make these donuts, so I went in search of a donut pan. It’s close to impossible to find one really. Don’t expect Walmart to have them. I was delighted to find this mini donut pan on Amazon for only $9.99 shipped. When I found this recipe I was really antsy to try it out. At 93 per donut, I was floored. That is for the full-size donuts and my pan is mini so mine will only have 46 calories per. When my donut pan came in the mail, I was really giddy. You can just imagine my excitement can’t you? My mail lady thinks I’m nuts. My pictures aren’t quite as good as her’s, but you get the picture. This recipe was surprisingly easy, however I will say this- it’s fairly difficult getting the batter into those little donut wells. Because it’s round you don’t want to get the batter on the little thing in the middle. I managed to get it done with a spatula in one hand and a spoon in the other. I’d say this is little sacrifice for chocolate donuts. 93 calories for a chocolate donut? Sign me up! 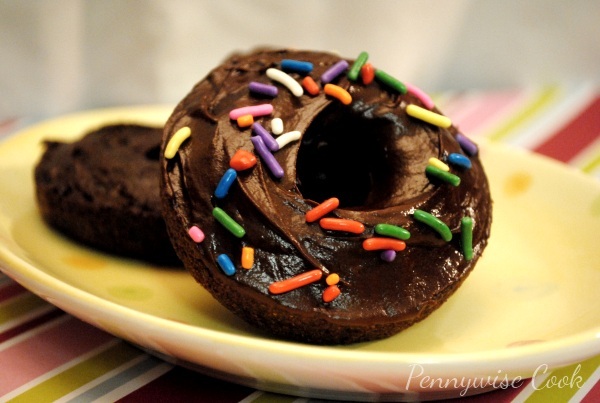 These chocolate glazed BAKED donuts will satisfy without packing on the calories. Preheat the oven to 450 degrees. Spray donut pan with cooking spray. Stir together flour, cocoa powder, sugar, baking powder, and salt in a large bowl. Add the egg, milk, vanilla, oil, and applesauce for 1 minute. Fill each donut cavity in the pan 1/2 way full. Bake for 7-8 minutes until donuts spring back slightly when touched. Cool. Meanwhile, melt the chocolate chips in a microwave safe bowl. Stir in the corn syrup and oil. Microwave at 20 second increments until completely smooth. Stir in the vanilla. Dunk each donut and allow to set. And like my husband says, these wouldn’t be what they are without the glaze so you’ll definitely want to make that along with these. They are a fantastic treat for after school for the kiddos and you don’t have to worry that they are high in calories and sugar. P.S.- if you don't have a donut pan, no worries. Use a mini or regular muffin pan and glaze just the tops. They will still taste as yummy. Since I made these the first time, I've found donut pans at Target for around $12.99- FYI. Your turn! Have you ever made donuts before? I’m not sure what it is, but lately I’ve had a thing for making things out of other things. Mostly healthier things that you wouldn’t expect. For instance, my recent discovery of chickpeas being used to make cookie dough dip- completely unexpected. I’ve used cauliflower to make mashed potatoes. I’ve even been toying with the thought of using tofu in a few dishes here lately, but haven’t brought myself around just yet. I’ll be sure to let you know when I do. I’ve always been under the impression that pigs would fly or hell would freeze over before my husband put tofu in his mouth. He has yet to catch on to my sneaky ways though *evil laugh*. As you know, I’m a pinterest fanatic. 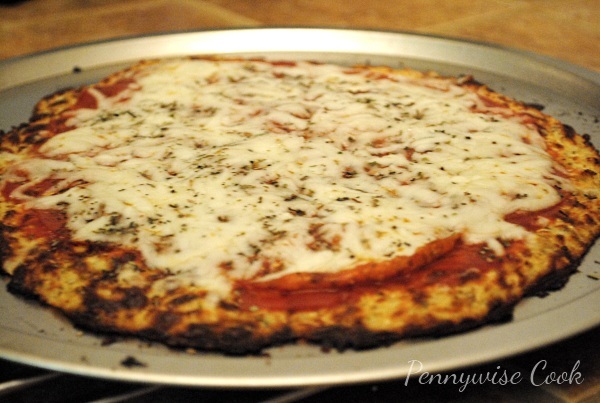 I found a recipe at Eat Drink Smile for Cauliflower Pizza Crust. Even though I like things to be made healthy, I was less than enthused about the thought of using cauliflower to make the crust of my pizza. However, I consider pizza to be the devil in food form sometimes. I NEVER eat pizza. It’s greasy, full of bread and cheese, and taunts me to eat more. I always feel awful after I eat it, like I just ate the entirety of a large cow. I know, I’m exaggerating. But you get the point now don’t you? So when I found this recipe I thought I can just try it out and see. It was either going to be very good or very bad. I blog here before you tonight to tell you that I (along with my picky-eating hubby and 4 year old daughter) give this cauliflower pizza crust my complete and utter stamp of approval! If you have a food processor or blender it takes no time at all and is fantastic, especially if you’re not into eating carbs and want a healthier version of pizza. It’s obviously not your average flour pizza crust, but it doesn’t taste like it contains cauliflower either. We made the traditional pepperoni pizza. You can’t see the pepperoni because I hid it under the cheese. I used the very large ones so that the entire pizza was covered in them. Our pizza didn’t actually turn out quite as burnt around the edges as this picture looks. It was pretty brown though because I was attempting to get the crust crispier. This type of crust will not be majorly crispy like most pizzas that you might be used to. One head of cauliflower makes 3 crusts and they aren’t huge, so they are fairly thin. I didn’t mind. We get to eat PIZZA! We made this a couple other times since the first and it turned out the same. I think I’m going to work on figuring out a way to get it a bit crispier. Either way, this recipe is a keeper and will surely make it possible for us to have pizza a lot more frequently. A healthy alternative to high carb pizza dough, this cauliflower pizza crust will make you want more. I promise! “Rice” the cauliflower by removing the stems and leaves and chopping the florets into chunks. Add the florets into the food processor and pulse until it looks like grain. Don’t over pulse or it will puree the cauliflower. Place the riced cauliflower into a microwave safe bowl and microwave for 8 minutes. No need to add any water. The cauliflower contains enough water to help it cook. 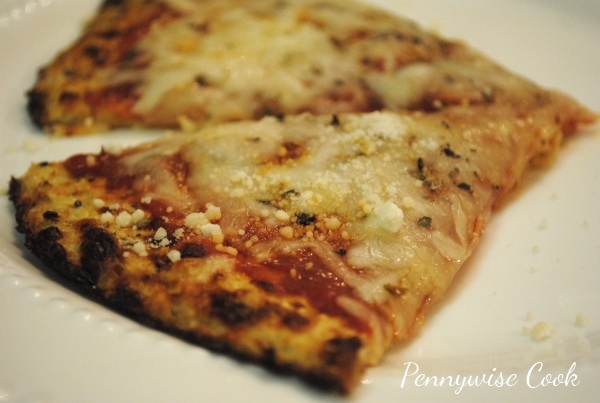 One head of riced cauliflower will make approximately 3 pizza crusts to use immediately or to place in the refrigerator to use within one week. Preheat the oven to 450 degrees. Spray cookie sheet with non-stick cooking spray. In a medium bowl, stir together 1 cup riced cauliflower, 1 cup mozzarella and 1 egg. Add the oregano, garlic salt and minced garlic. Mix well, then transfer to cookie sheet. Use your hands to pat out into a 9? circle. Optional: Spray with cooking spray or brush with olive oil to help with the browning process. Remove from the oven and top with toppings of choice. Turn on broiler and let heat up. Place pizza under broiler for approximately 3-4 minutes or until cheese has melted. Your toppings should be completely cooked since you’re only broiling for a few minutes. And do let me know if you try this and how it turns out for you. I want to know that I’m not crazy in thinking this is actually comparable to regular pizza! Happy Saturday everyone! It’s been a busy week around here. I’m currently attending the Blissdom conference here in Nashville, TN at the beautiful Gaylord Opryland Hotel. It’s super swanky. I think I’m finally understanding the layout of this hotel. It only took me 3 years to figure it out. It’s HUGE! It reminds me of the Titanic for some reason. I think it’s the beauty and how some of the outside looks rounded like a boat. Addie and I love doing crafts together. Addie loves not eating her vegetables. Put those two together and you have celery art! I mean come on, if you’re not going to use your veggies for nutrition and nutrients, use them for a beautiful painting right? I saw this idea in the recent issue of Family Fun and I thought how genius! I guess I’ve never really cut celery up like this and realized how much it does sorta resemble a flower. Add some paint and you can really see it! It’s really that simple to do. 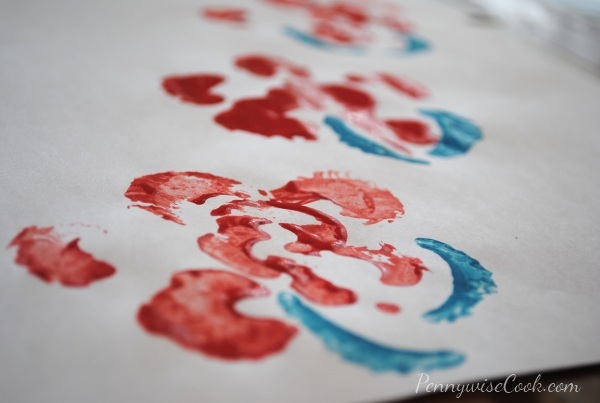 Because there aren’t really a ton of steps, kids actually pay attention long enough enjoy this craft! This craft is especially good for using up that celery that is on the brink of going bad. 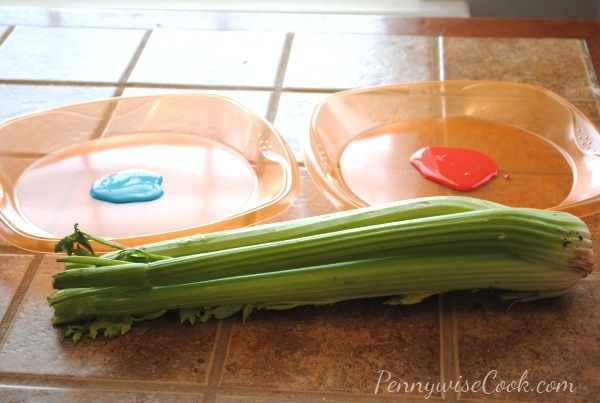 Grab some paint (whatever you have on hand) and get to dipping those veggies! The result is pretty Celery flowers that are even frame worthy! We did actually frame ours, but I didn’t get a picture yet. I may have to come back and add that later for you. How-To: To begin, remove one stalk for making the “leaves”. 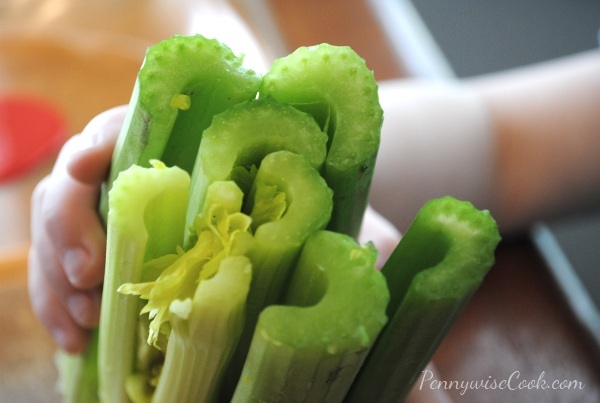 Then cut your celery stalk about halfway down. Where it’s bulkiest is best. You don’t want to be too close to the top or your flower will be small. 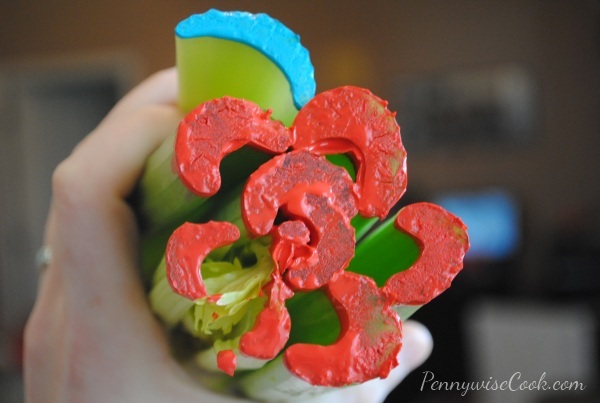 You may have to hold the celery firmly to keep the pieces from trying to move around when making the print. And to make the cute little leaves, simply use your single stalk. Also, be sure to stamp the celery a couple practice times before doing the “real thing”. The paint can often be very thick on some pieces right after you dip. Cupcakes will always be one of my most favorite things to make, ever. Individual cakes? Come on. How can you not love your own little cake with icing and all? 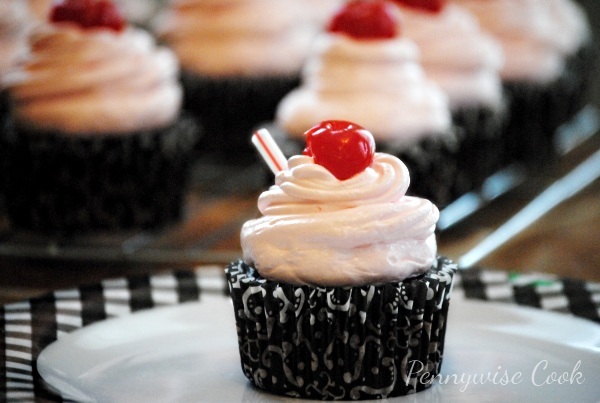 What about a Cherry Coke Cupcake? And how about let’s make it chocolate too! I think that sounds like a fantastic combination. This cupcake ended up quite cherry-y. A lot more than I had planned, but it was quite tasty. One I will definitely make again. 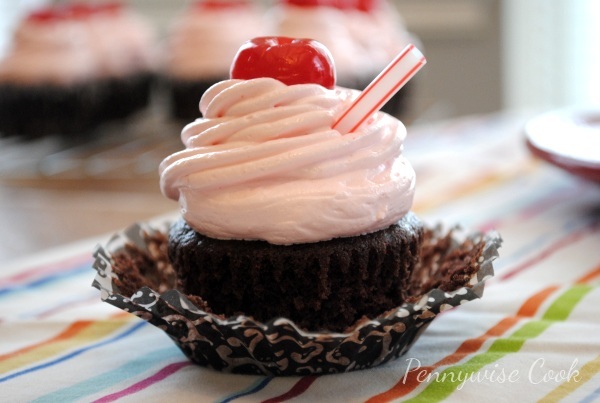 It wasn’t until I set out to make these cupcakes that I realized how hard it was to find Cherry Coke these days. I used to drink it a lot in high school and it was pretty easy to find. I had to settle on Wild Cherry Pepsi to make these, so they may come out a bit different for those who are actually able to find Cherry Coke. Oh and just a little secret, I also used DIET Pepsi Wild Cherry. This made these a little better on the calorie side. You know me, always making things a bit healthier. I also used egg white substitute instead of plain old egg whites, but feel free to use real egg whites. The frosting on these babies is a very fluffy cherry frosting with BIG taste. I really enjoyed using something other than your everyday buttercream. Sometimes that can be so heavy. 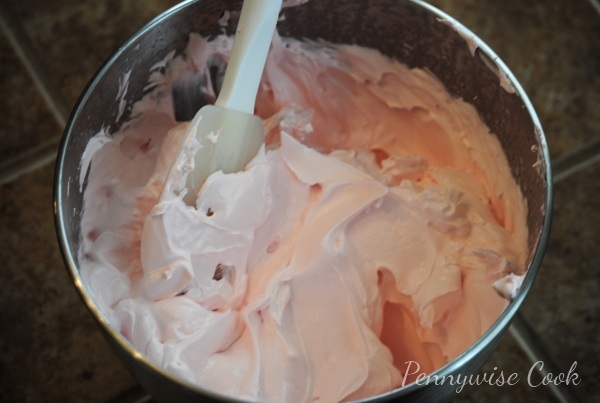 Made with mainly egg whites, boiled and then whipped, this frosting was very easy to pipe onto the cupcakes and made for a very pretty color! It was fantastic. I’ll be using it again. You most definitely don’t have to make yours as diet as I did. After all, you’re already making cupcakes. It’s just in my nature to get my food as low in calories as possible. Any little shortcuts that I can make without sacrificing taste makes me happy! Cherry coke lover? 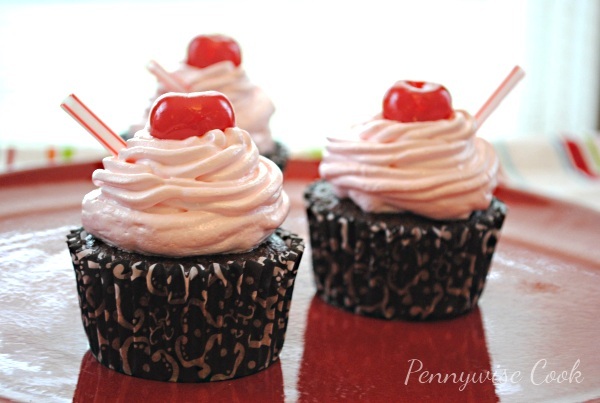 These cupcakes are the perfect combination of chocolate and cherry coke with a healthy twist! Mix cake mix, egg whites, and cherry coke in a bowl. Pour into cupcake liners and bake according to cake mix directions. Simple! In a heavy saucepan, mix the sugar, egg whites, water, cherry juice and cream of tartar. Mix on a low speed with hand mixer for 1 minute. Continue to beat on low over low heat until mix reach 160 degrees on a candy thermometer. This will take about 10 minutes. Transfer to heavy-duty stand mixer bowl. Add the extracts. Beat on high until stiff peaks form. This will take about 7 minutes. Add your cherries and you’re done! I’m one of those sweet and salty folks. I’d like to say that I’m more sweet than anything, but I have a salty side too. Who doesn’t? I’m the kinda gal who might enjoy a really indulgent piece of cheesecake and then have to go eat a cracker to offset the sweet. I think I got this from my momma. She always does this. 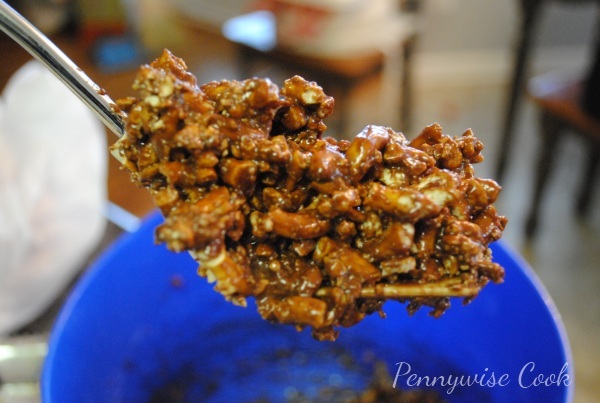 I threw this recipe together one day when I was craving something rice krispie treats. I had some pretzels in the cabinet and thought how fitting for a sweet and salty kinda bar to combine marshmallows and pretzels? And of course, peanut butter and chocolate are the only other two ingredients that could make this that much more incredible. Within about 10 minutes, I created these bars and they were fantastic. With only 5 ingredients, you can’t go wrong. I love the crunch that you get in every bite. Some may not like that about these, but if you’re a crunchy kinda person, I think you’ll enjoy them. Not really knowing what I was going to do with these ingredients, I threw a bag of pretzels in a bowl and broke them up. You can get them super finely crushed if you prefer. To keep it light and avoid any extra buttery calories, I refrained from adding anything to them. Next, I got two pots heating up each with half a bag of mini marshmallows inside to melt. Peanut butter in one and chocolate chips in the other. I must warn you though, it will take every bit of willpower that you have inside to not eat the entire batch of peanut butter marshmallow mixture. After putting half the crushed pretzels into a second bowl, pour the chocolate/marshmallow mixture into one pretzels bowl and the peanut butter mixture into the other. At this point, there is no chance of fighting the willpower. Just take a bite of the chocolatey pretzels. I’ll forgive you. 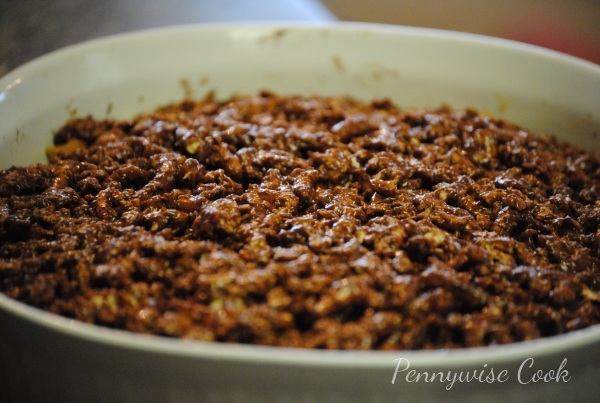 Flatten both mixtures into a pan starting with the peanut butter on bottom and then following with the chocolate. I used a shallow oval dish. Let sit in the refrigerator for a bit to set and you’re done! 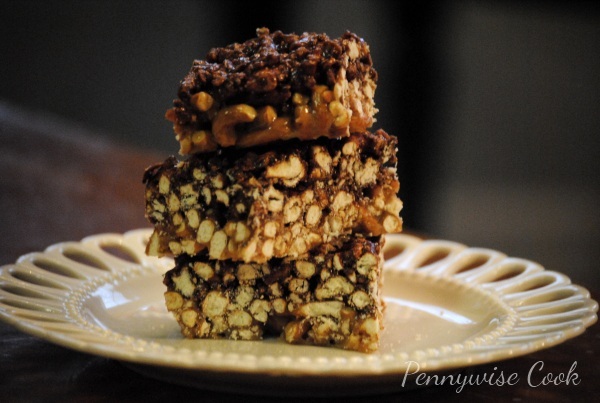 Get that sweet and salty yumminess in one bite with these chocolate and peanut butter pretzel bars! 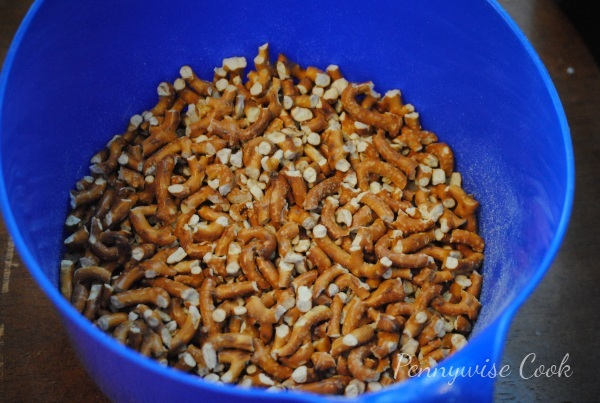 Crush the pretzels up either in a bowl or in a ziploc bag. Place into two medium-size bowls. 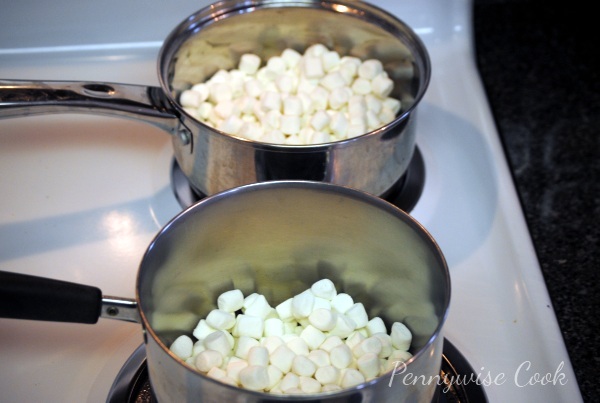 In two sauce pans, place half the bag of marshmallows in each along with 1/4 cup milk. Melt them until almost smooth. Add in the peanut butter to one sauce pan and the chocolate chips to the other. 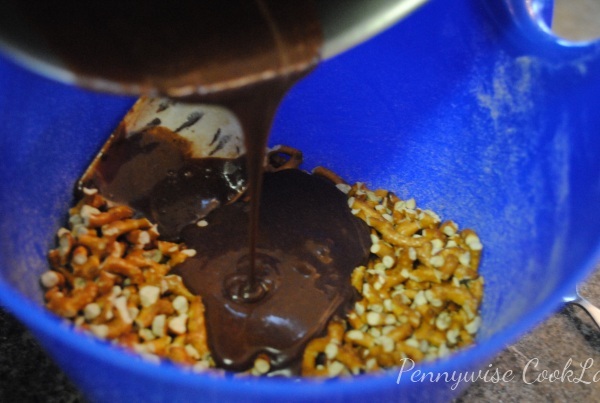 Once mixed well, add peanut butter mixture to one bowl of pretzels and chocolate to the other. Mix well. 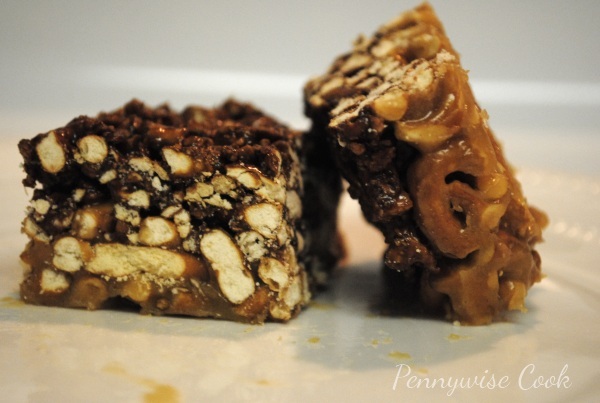 Flatten the peanut butter pretzels to the bottom of a greased square dish. Then flatten the chocolate pretzels on top of that. Place in the refrigerator to set. Cut into squares and serve! There is but one food that I know for sure that both my husband and oldest daughter will eat- fries. I can also be positive that there won’t be even one left in the pan when dinner is over. The problem lies with trying to find the perfect method for getting them exactly the way we like them, crispy. Time and time again I would attempt a few different methods that only ended up with huge pieces of potato with spots of crispiness but mostly just soggy. Don’t get me wrong, I still ate them but deep down I wished they were crispier. Don’t we all? While we’ll never truly figure out the technique that McDonald’s has for the perfect french fry (or do you know? can you share? ), we can try to get as close as possible. There were two things different about this recipe than most that I’ve tried. 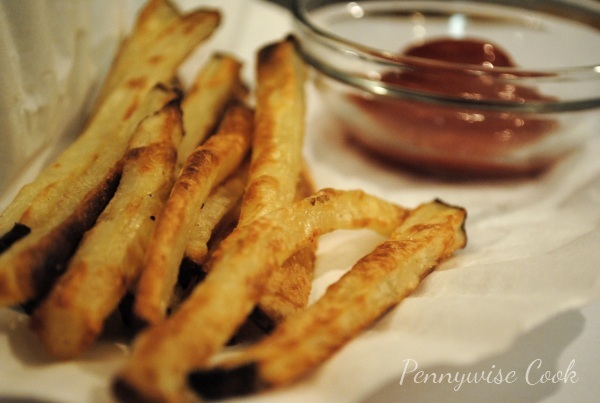 1) you boil the cut fries before you bake them and 2) you broil them towards the end to give them that extra crunch. Somebody has been using their noggin! While I’m not completely sure this is the absolute best that home fries can be made, this is most definitely the BEST home fries that I’ve ever made! And the crispiest too. Try it for yourself and let me know what you think or any suggestions you may have. These would make a great side dish for Easy Black Bean Burgers. A trick for making your homemade oven fries crispier! In a big pot, place sliced potatoes into water and bring to a boil. Once boiling, add salt. Cook the potatoes until they are about 3/4 the way done. This should take about 4 minutes. Stick your fork in one- should still be a little tough to remove it. However, you don’t want to over cook them, otherwise they may end up too soft. Remove from heat and strain, then run under cold water to stop the cooking process. Pat dry with paper towels. In a large bowl, toss the fries with olive oil and seasoned salt. 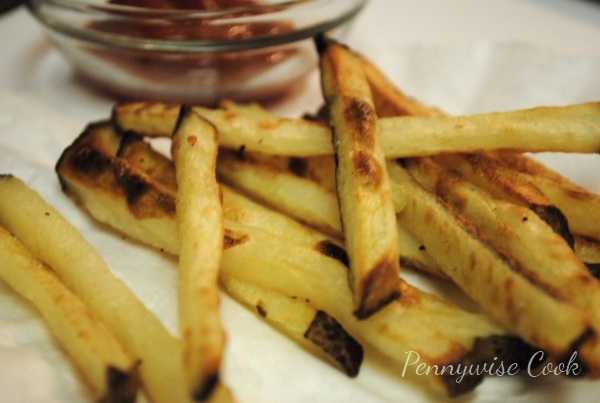 Spray a cookie sheet with cooking spray and place fries in a single layer. Cook for 15 minutes. Remove from oven and flip them over. Return to oven to cook for an additional 10 minutes. Set your oven to broil and let get completely heated. Broil the fries for 5 minutes or until you are happy with the crispiness. The biggest thing is the watch the fries once you begin to broil them. They can burn very easy so it’s very important to keep an eye on them during this process. This recipe can be easily adjusted and there are tons of ways to make them by adding other seasonings! 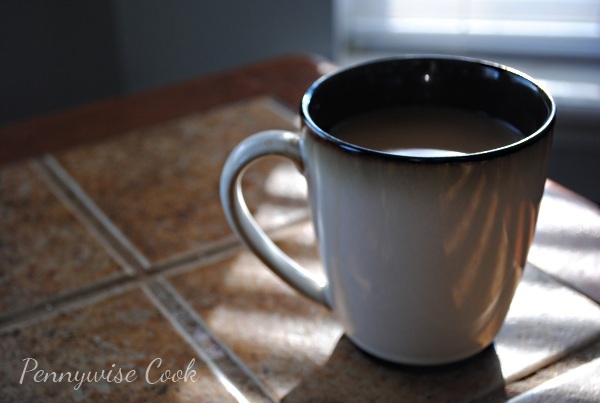 Most mornings I have to start with my cup of coffee. While I think it’s mostly a mind thing, somehow my body thinks that I really need that caffeine to get my day started. Days that I skip it, I feel as though my days are off. We’ve been out of k-cups lately so I’ve been using my little refillable k-cup to make it. The funny part is that we had these grounds in a container for so long, I can’t remember if they are regular or decaf (from when I was pregnant). So at this moment, I could be fueling my day with decaf. Heck, I’d never even know it! There have been some fabulous prices on bananas lately. Not sure if it’s a bumper crop or what the case is but most stores (even Walmart) have come down significantly on bananas. Aldi holds steady around $.44 per pound most weeks. Kroger and Walmart have both had them for $.38 per pound recently around here and I can’t help but find something to make with bananas when they are that cheap. They are so good for you and can be used in so many recipes. Like these pancakes for instance. 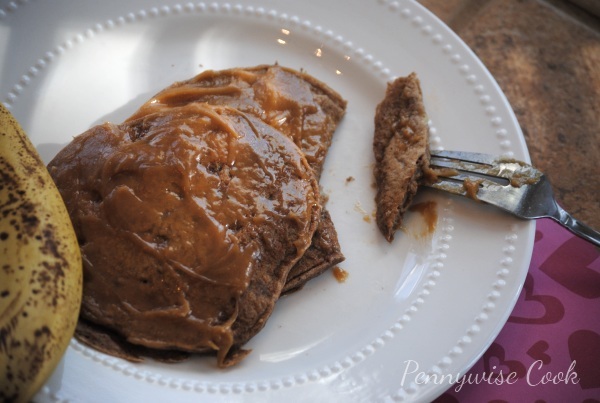 Whole Wheat Peanut Butter and BANANA Pancakes to be exact! They are oh so incredibly yummy. I can’t find the blog where I originally got this recipe, but I did find an exact replica over at Food.com. These are very good at hiding their nutritiousness. I don’t think that hubby or my 4 year old even blinked an eye at the fact that they were mainly whole wheat. I think the mixture of spices and creamy banana worked very well together and created a pancake that I think even Elvis himself would have approved of. 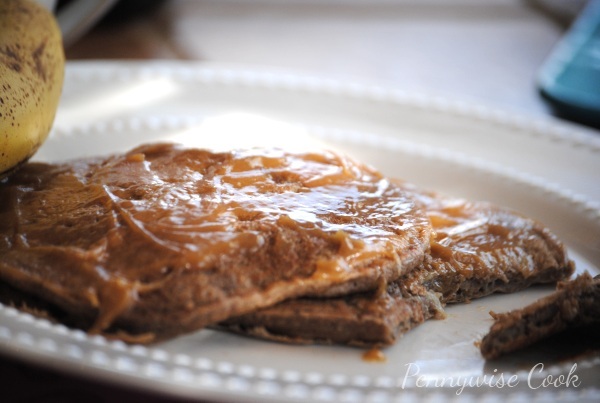 It’s amazing how much these taste just like a peanut butter and banana sandwich! When it came the syrup, I wasn’t really into cooking anything else. Around here, most mornings my breakfast consists of a cup of yogurt on the go. So I just mixed up some creamy peanut butter with my sugar free syrup to spread over top and it worked beautifully (thankfully). I will admit that the ingredients do seem like a lot of work. But for the occasional Saturday morning, I can totally see whipping up these scrumptious babies. 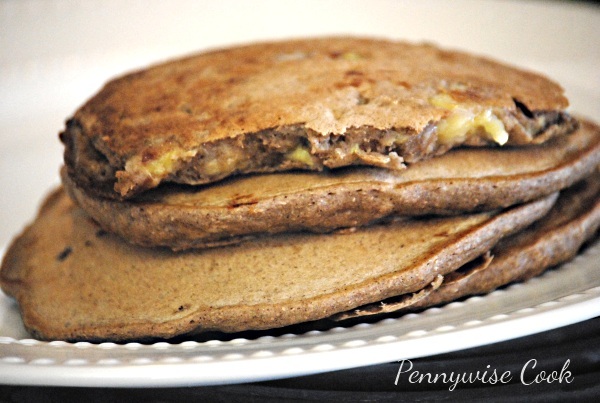 Pancakes similar to a peanut butter and banana sandwich with a healthy twist. Even the king would approve! Add the whole wheat flour, all-purpose flour, splenda, salt, cinnamon, cocoa powder, and baking powder to a bowl and mix well. Be sure to sift the whole wheat flour, it can get clumpy. Add the rest of the ingredients to the dry ingredients. Spray your griddle or skillet with non-stick cooking spray and heat to medium. Cook the pancakes until they start to bubble and then flip. Cook for another 1-2 minutes and continue in batches until done. So to kick off Pennywise Cook’s launch and I guess to celebrate a place for me to share, I have a giveaway! Have you been eying cookware or utensils lately? Chances are that Amazon has what you are looking for. And at a darn good price too! 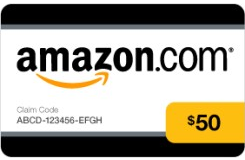 So I thought what better of a giveaway than an Amazon Gift Card! Spend on something you need, save it for a gift, or just blow it! Whoever wins can do whatever they please with their gift card. 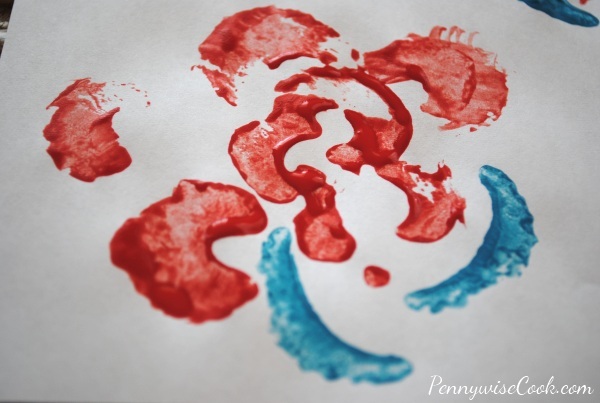 Mandatory Entry: Leave a comment on this post with your thoughts about Pennywise Cook! Tell me what you think about the colors, the layout, the recipes, whatever! Become a fan of Pennywise Cook on facebook. Leave comment on this post telling me that you did/are. 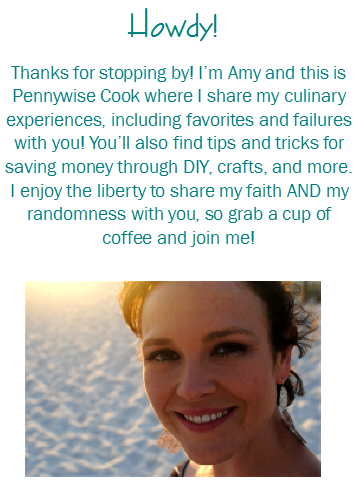 Sign up for Pennywise Cook’s daily recipe via email! Leave comment telling me you did/are. Follow Pennywise Cook on Pinterest. Leave a comment saying you did/are. This giveaway will end on Wednesday, February 29th at midnight CT. I will contact the winner on Thursday, March 1st and they will have 24 hours to respond. If I have not heard from them I will name a new winner. This giveaway is in no way affiliated with Amazon. I am providing the winner with a $50 Amazon Gift Card.